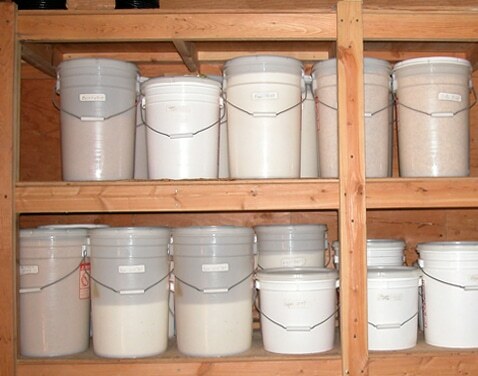 When I started my food storage, these ten basic foods were the first things that I stored. Since then we have expanded our storage and added many other foods, including dehydrated and freeze-dried. But if are just starting I would encourage you to store these ten basic foods first. This will give you the most bang for your buck. Rice is inexpensive, stores well and beans and rice make a complete protein. For long-term storage, you should use only white or parboiled rice. Do not store brown rice, it only stores about 6 months before going rancid. Beans, various varieties, beans and rice make a complete protein when served together. Beans are inexpensive and store well. Honey or sugar. Honey is the best choice if you can afford it, if not store white sugar. Whole grains, wheat berries, quinoa, whole corn, spelt and rolled oats. The choice of which grains to store to a large part depends on what your system will tolerate. Wheat is great if you can tolerate the roughage and are not gluten intolerant. But regardless of which grains you choose, you need to incorporate them in your diet so that you are used to them. Remember you can sprout many of these grains to give you a source of fresh greens and vitamin C.
Iodized salt. You need iodine in your diet to stay healthy. Salt is also a great preservative for any many other foods you may run across. Powdered milk is a good source of protein. Properly packaged it can store for 20 years or more. It adds a tremendous variety of recipes to your cooking. Cooking oil should be rotated regularly to avoid them going rancid. Store in a cool dark area. Multi vitamin, a good one will make sure you get all the nutrients that you require. Spices need to be stored in sealed containers. We have found that vacuuming sealing them with a food saver extends there shelf life. In a long-term emergency, you never know what you will end up eating and even the rats will taste better with a little chili powder. Like I said at the beginning this is just a framework to build on. It will keep you alive, but I would not want to have to live on just these ten basic foods. But it is an inexpensive way to start. Venezuela Style Martial Law, Is It Coming to the United States? This entry was posted in food storage and tagged food storage, ten basic foods, ten foods you need in your storage. Bookmark the permalink. I store iodized salt and salt without iodine and caking agents. You use more than you think and way more in grid down. Penzy’s and others sell spices already sealed in bags. Much cheaper in bulk than the grocery store. And I keep them for a long time past the best by date. It might make a difference to a chef, but not to a home cook. When I store in buckets, I throw in a label with the contents in case the outside label fails, I still don’t need to to open the mylar bag. And with the label are a couple quart zip lock bags: for charity, or moving small quantities. There are many shelf stable foods that I store and use daily. These include a variety of tomato based pasta sauces that come in glass jars, various types of dry pasta, and wine in gallon jugs. I have also found that cheddar and jack cheeses that come in plastic wrapped 2 pound blocks and various buttery spreads that come in 1 pound plastic tubs are still very tasty after a year of storage in a dark closet in a room that never gets above 70F even in the summer. Dehydrated veggies and powdered eggs that come sealed in #10 cans store for years and are still good for at least many months after they have been opened. Thanks for the list, I did not know that brown rice spoils so quickly – of course my wife will be happy to hear this since she cant stand brown rice.